Located at 2328 Lake Place in Minneapolis, the Purcell-Cutts House is a gem of the Prairie School style, and one of the most significant examples in the country. 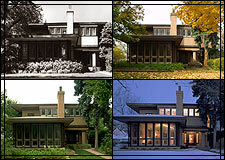 Explore the Purcell-Cutts house online by following a linear tour or by selecting any room in the house at any time. Beautiful photography, 360-degree room views, historical photos, and informative commentary bring the house to life. Itâ€™s the next best thing to being there. Architects William Gray Purcell and George Grant Elmslie designed the Edna S. Purcell house in 1913. Now known as the Purcell-Cutts house, it was bequeathed to the Minneapolis Institute of Arts in 1985 by Anson B. Cutts, Jr., the son of its second owner. The Purcell-Cutts House is open the second weekend of each month for tours. Admission is $5 for adults; $4 for students and seniors; and free to Institute members and children 12 and under. Reserve tickets online and click here for more information about the tours. You can also call (612) 870-3000 or (888) 642-2787 (ext.6323) or stop by any Visitor Services Desks at the Minneapolis Institute of Arts for reservations and more information.